So, What Does A Black Hole Look Like? At six simultaneous press conferences around the globe, astronomers on Wednesday announced they had accomplished the seemingly impossible: taking a picture of a black hole, a cosmic monster so voracious that light itself cannot escape its clutches. This historic feat, performed by the Event Horizon Telescope (EHT)—a planet-spanning network of radio observatories—required more than a decade of effort. 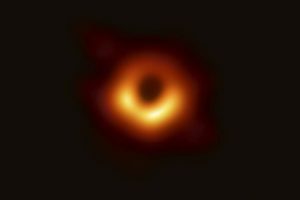 The project’s name refers to a black hole’s most defining characteristic, an “event horizon” set by the object’s mass and spin beyond which no infalling material, including light, can ever return.